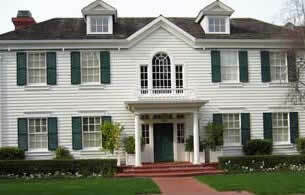 Buy shutters online today! Choose a category below to see styles, pricing and information. Authentic Exterior Custom Decorative or Functional Outdoor Wood Shutters For Your Home! For durable exterior wood shutters that are appealing to the eye and fit well with many different types of windows, the authentic wooden shutters for sale in our store are an excellent choice. Not only are there several different styles and types of material to choose from, we also separate them into three sub-categories: PlacerCraft Custom Wood Shutters, Premium Cedar Shutters and Cedar Movable Louver. All decorative and functional exterior shutters can be tailored to a certain extent, but there are some key differences in each worth being aware of. Compatible with hardware also available on our site, PlacerCraft outside products are useful for anyone who wants raised panels, Board & Batten, Louvers or Bahama Style shutters. In addition to that, there are five different types of wood available for these outdoor wood shutters, from Southern Yellow Pine to California Redwood to Sapele Mahogany. We know these different types well, and you can compare each one on our site to figure out which combination of style and wood is the best match for your home. These attractive and easy-to-install shutters make for effective outdoor wood shutters that can last a long time. The exterior wood window shutters require just a little bit of maintenance and are covered by a limited warranty. Made from sustainable Western Red Cedar, you can find shutters in the Fixed Louver, Panel Shutters and Board & Batten styles. Choosing from these, you can pick the exterior wood shutters with the most personality to attach to your windows and count on them for prolonged use. 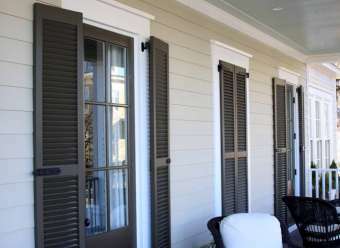 A combination of historical style and modern engineering makes these outdoor wood shutters remarkable fixtures that add a classic look to a home. They are also Western Red Cedar shutters in the Savannah Plantation style, and are intended to survive rot while lasting for many years of use. Find out more about these and other shutter options by browsing our website today. Choose Larson's Outdoor Wood Shutters for Affordable Quality! Bahama / Bermuda Style Shutters. Authentic exterior wood shutters for your house. Custom exterior shutter styles available. PlacerCraft Custom Wood Shutters include our low priced Southern Yellow Pine Shutters along with higher quality woods like Western Red Cedar, California Redwood Shutters, Sapele Mahogany. Quality construction and many options including primed and painted choices make this a popular choice for custom outdoor wooden shutters.